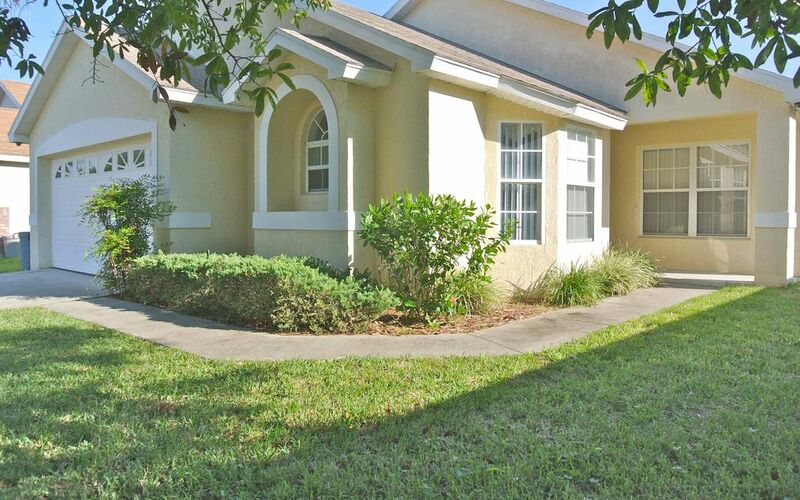 SUNNYHOME Vacation Villa - Minutes from Mickey! Welcome to our SUNNYHOME away from home! This is a 4-bedroom/3-bath vacation home, full with every amenity you’ll need and ready to entertain you and your family when you’re not exploring Orlando. Disney’s community of parks is just 10 minutes away, but when you’re not spending time in the parks or at Disney Springs, you’ll be glad you booked with us! The master bedroom and queen bedroom each have their own private bathroom, perfect for 2 families to share the house. The kitchen is fully equipped with a stove, microwave, full size refrigerator, and all the other utensils necessary to prepare your favorite dishes. Our home is equipped with WiFi and a TV with cable in each room. You will also find a ping-pong and foosball table in the garage! There is a private pool and spa right outside, perfect for your family to spend a day in the sun and take a small break from long days in Disney’s parks. Heating can also be provided for the pool and spa for an additional fee! Just outside the private pool area is an open field to play sports, as well as a community basketball and tennis courts, and playground for kids. We'd love for you to stay at our vacation home! Feel free to reach out with any questions and if there is anything we can do to improve your stay, please let us know! So close to Disney that you can go to the parks in the morning, come back for lunch, relax, then go back later on to finish your day right before the fireworks. Only 5-10 minute drive to most Disney Parks. POOL HEAT IS EXTRA $20 PER DAY. This rental was had everything we needed at a great price. It could have been cleaner but the owner was extremely accommodating. Great place. Will book again next trip to Orlando!! Thx Johnny!! Beds comfort less than desirable, time for new toilets, vanities and paint. Location excellent. The coded access lock needs to be look at since it usually takes three to four tries before the gear system fully activates the deadbolt. Convenient location, excellent home, & great price!! I was kind of skeptical at the last minute based off recent reviews right before my stay. I’m glad I followed through because everything was perfect for my family and I. The owner was very professional and responsive with all questions I hqd prior to my trip. The house was nice and clean. The location was very convenient to everything we had planned to do. We had a problem with working the living room tv but we were able to call management and Ralph walked us through it and we had no more problems after that. I want to start this by saying we stayed in this house in October 2015 and LOVED it. This stay we just had from October 27-November 6, 2018 was the total opposite. The first night we arrived we noticed the house needed a major cleaning. All of the decorations have dust on them. The tops of the curtains have dust it. The floors need a major cleaning. The baseboards had dirt built up on them. The pool area had mold in multiple spots. The pool/spa heat was not working. We called Ralph(management company). He came right over. We thought he at least fixed the spa/pool heat. It was only temporary. Each day there were issues with the spa not working correctly. We contacted Ralph and the owner multiple times regarding this. Ralph said he called the pool company but the one time we know they were there(with wife and kids left in the car) we came back from the store and spa was not up to temp and jets not working right. Another night the spa was totally empty. Called and text both the owner and Ralph. The owner said said he would call Ralph. The spa never worked correctly from that point on. The ceiling in the living room had a leak in the ceiling which I called Ralph about and sent pictures to both him and the owner. Ralph never came to check on it and the owner never responded. I wish I could post pictures here so the conditions of the house could be shown or so I could show the text messages I sent while there. If I could give no stars I would. The one time I did talk to the owner he told me he would get back to me. He never did. We paid to have the spa and pool heated and got to use it only a few nights of the total stay. Totally disappointed and disgusted with the lack of caring by the owner and management. Vacation Villa is Located in The ' Indian Creek' community, which is quarter of a mile from route 192 and near marker 5. World Drive is only 3 miles away and Disney's main gate is about 3.0 miles. Animal Kingdom is 2 miles away, thru side road. Very close to Disney World. and only 10 miles to Universal Studios and 8 miles to Sea World.